First up is Rra Dinare, which means Father Buffalo in Botswana’s local language, Setswana. This new addition to the Okavango Delta’s vast array of safari camps is located in the southeastern sector in a private concession bordering the Moremi Game Reserve. 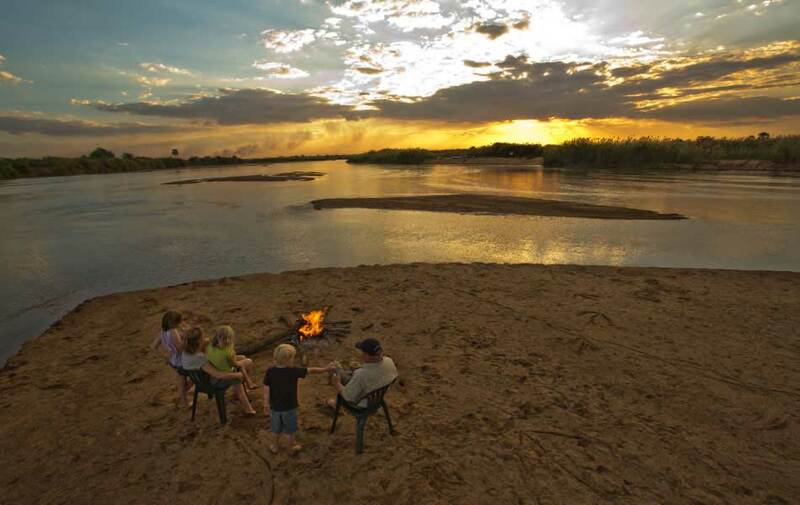 Under One Botswana Sky has an impressive selection of safari accommodation, so Rra Dinare has arrived into into a tried and tested safari family. 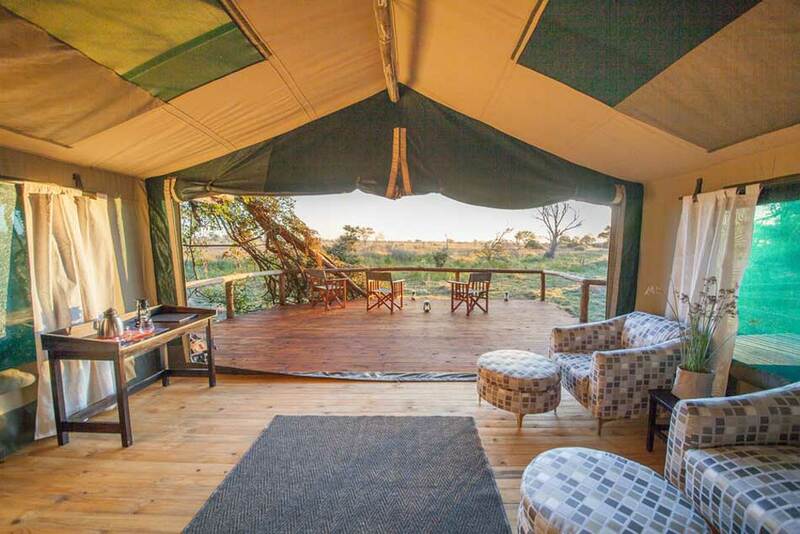 There are 8 tented suites, raised on wooden decking, overlooking the Gomoti River and the floodplains beyond. 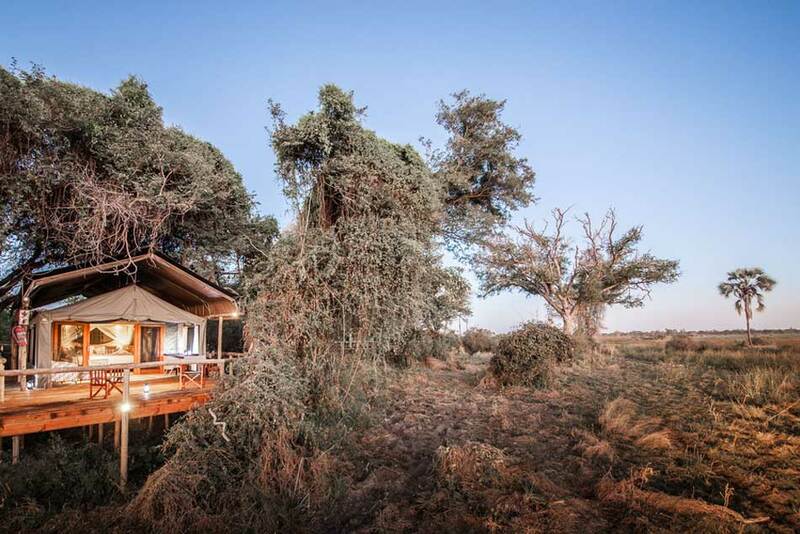 This is an exclusive concession offering uninterrupted game viewing and tranquility all round, while a private airstrip services the camp (20-minute flight from Maun). There is a swimming pool, a curio shop, a viewing deck with a boma under open skies, and seasonal walking safaris and water activities. Bring on secluded Delta paradise! 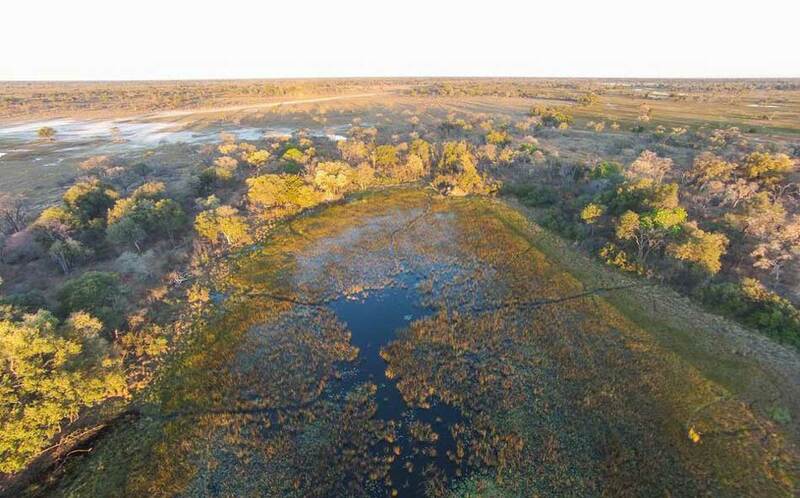 Highlight: Exclusive Okavango Delta with private airstrip. 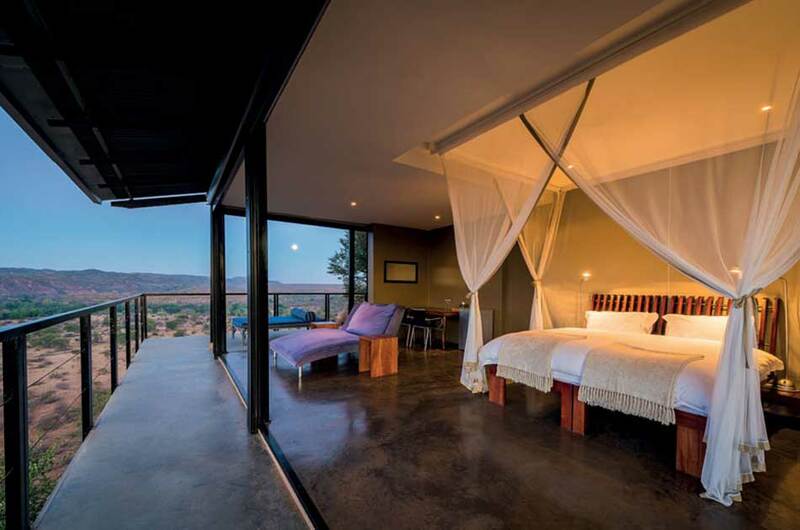 Thorntree River Lodge – an existing lodge – was bought and revamped entirely by African Bush Camps, and it opened its polished doors this year. 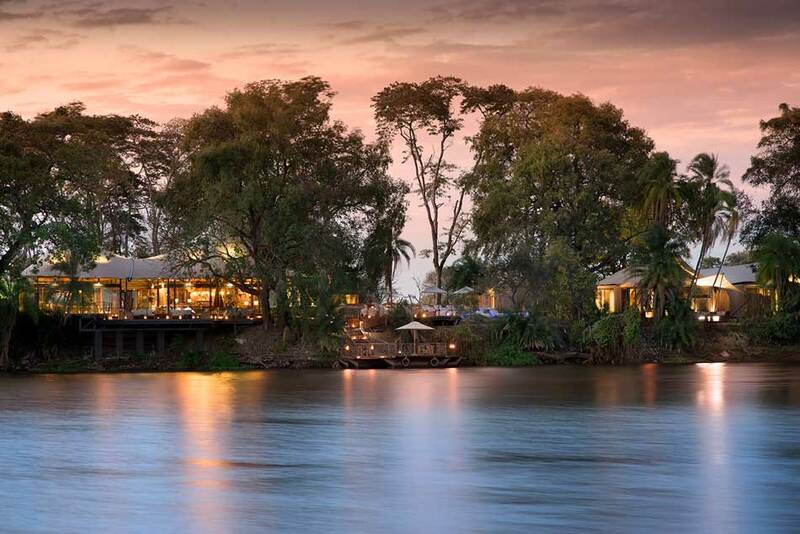 A prime location on the Zambezi River in Zambia’s Mosi-oa-Tunya National Park, Thorntree is shaded by lush riverine trees, offering each of the 10 rooms privacy in the form of forested surroundings, while the location is only a short distance from the vibrant African town of Livingstone and the world-famous Victoria Falls. Two of the rooms are family units, making this a fantastic option for parents and children (no age restriction), while every room has a plunge pool, and indoor and outdoor bathrooms. The newly renovated lodge is sleek and chic with contemporary design carefully integrated with locally inspired features. It is eco-friendly, and offers guests the opportunity to experience a complete range of safari activities, including rhino trekking, sunset boat cruises, cultural village tours, and game drives. 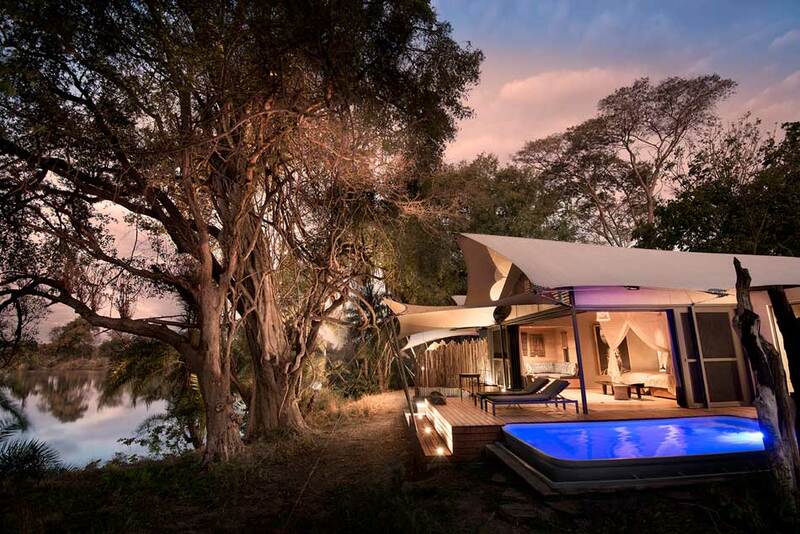 Highlight: Private plunge pools overlooking the engorged Zambezi River. 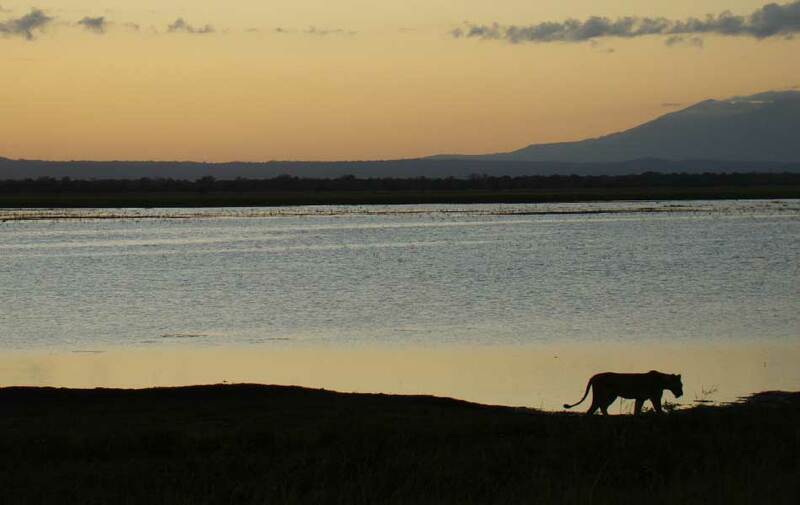 Wilderness Safaris is synonymous with safari expertise and quality assured experiences. Its newest addition is no different, but it is entirely unique: Bisate Lodge is located in the Volcanoes National Park region of Rwanda, which is one of the world’s last remaining habitats for the endangered mountain gorillas. 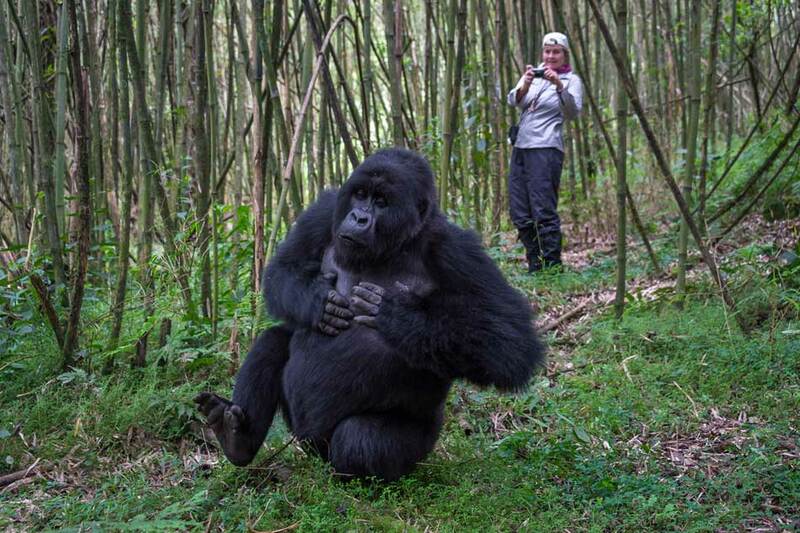 The intense and invigorating experience of trekking with gorillas is what pulls nature lovers to the Central African rainforests each year. 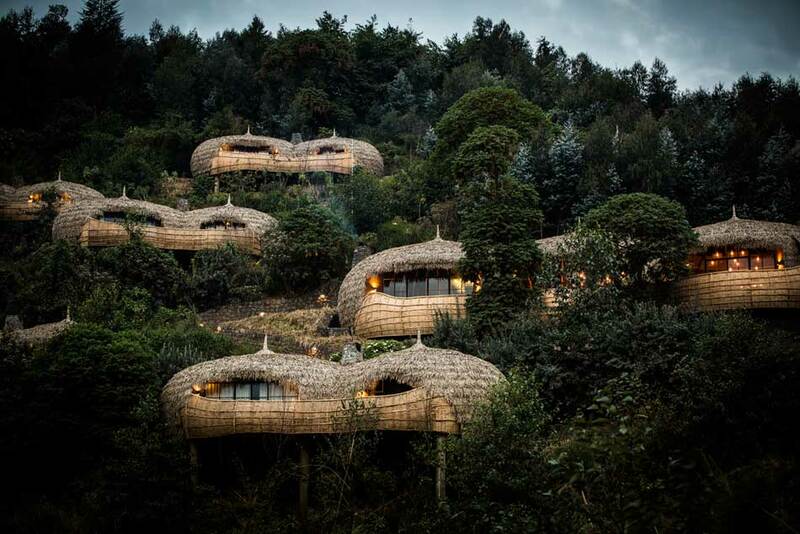 Bisate Lodge is luxuriously positioned in the Afro-alpine forests of the region, and overlooks luscious peaks of old, inactive volcanoes from its 6 woven, nest-like accommodation pods, which are nothing less than perfectly suited to the surroundings. Conservation is first on the agenda, and Bisate Lodge contributes to environmental sustainability as well as community benefits. Highlight: Easy access and close proximity to gorilla trekking start point. 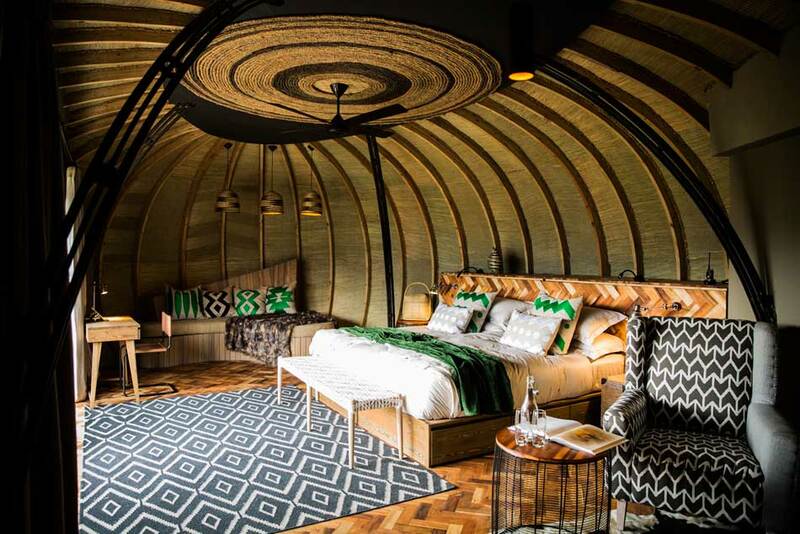 The opening of Muzumu Tented Camp is a victory for conservation, which has seen a lot of hard work go into lovingly restoring and rehabilitating Gorongosa National Park in Mozambique. 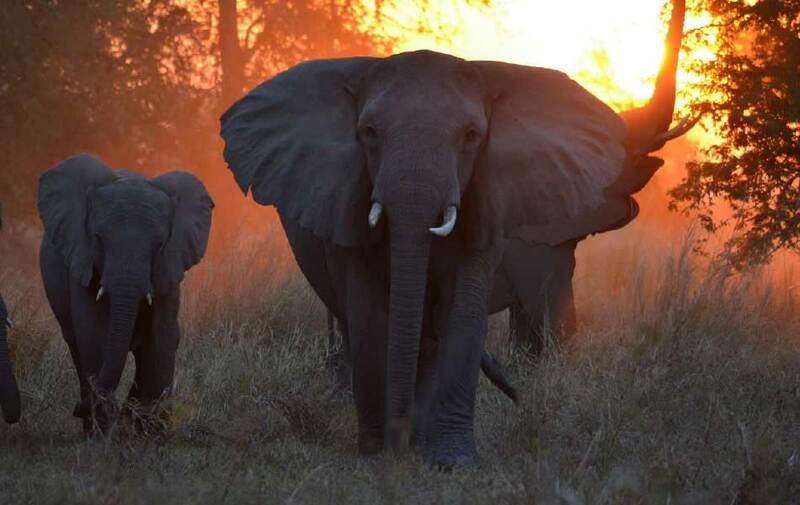 After civil war and illegal hunting devastated the area in previous decades, this inimitable National Park has been brought back to its former glory. 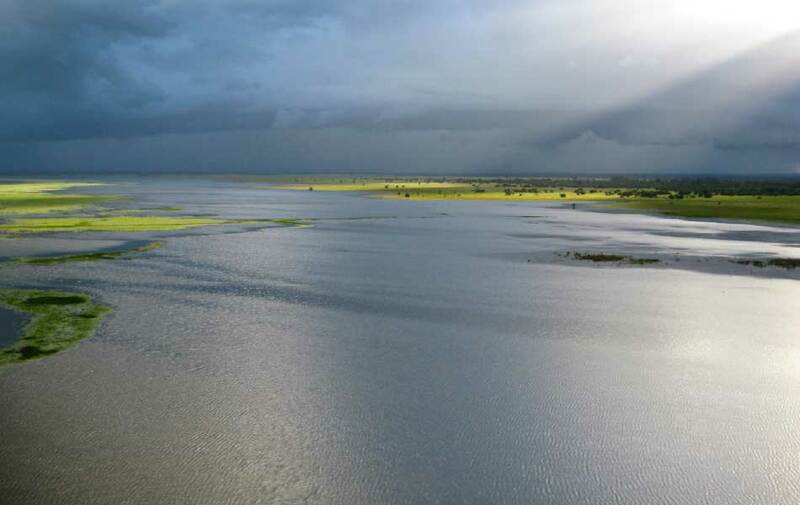 Conservation projects and wildlife translocation has once again brought life to the vast floodplains, rivers, limestone cliffs, enigmatic forests and waterfalls of Gorongosa. Muzimu Tented Camp has not opened yet, but it will be the first luxury camp to be built in the park, and the experience it offers is truly something else. 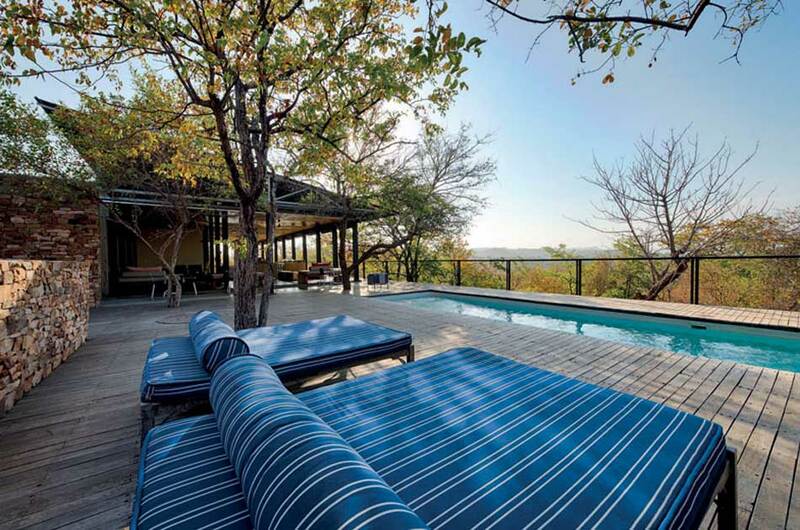 Positioned high up on the steep bank of the Mussicadzi River, views are endless, and wildlife is abundant. 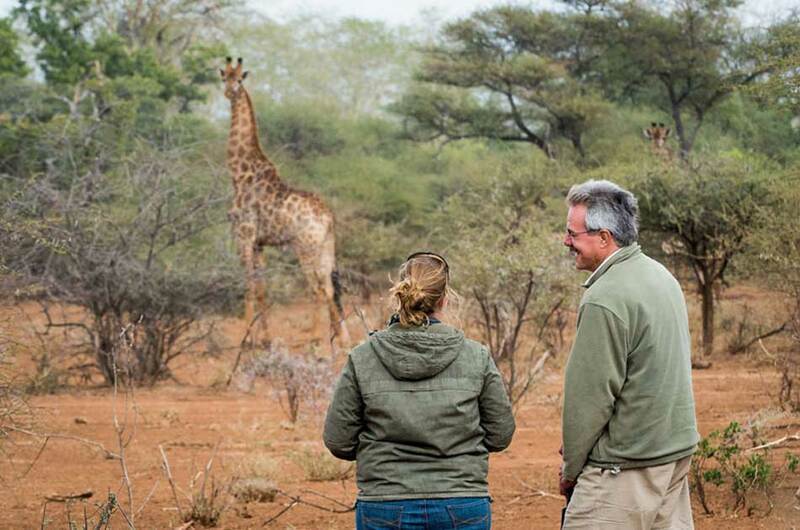 The biodiversity of the region makes safari activities incredibly unique, while life at the camp is set out to impress with added luxuries while staying true to conservation and a light environmental footprint. Highlight: Undiscovered traverse with extraordinary biodiversity. 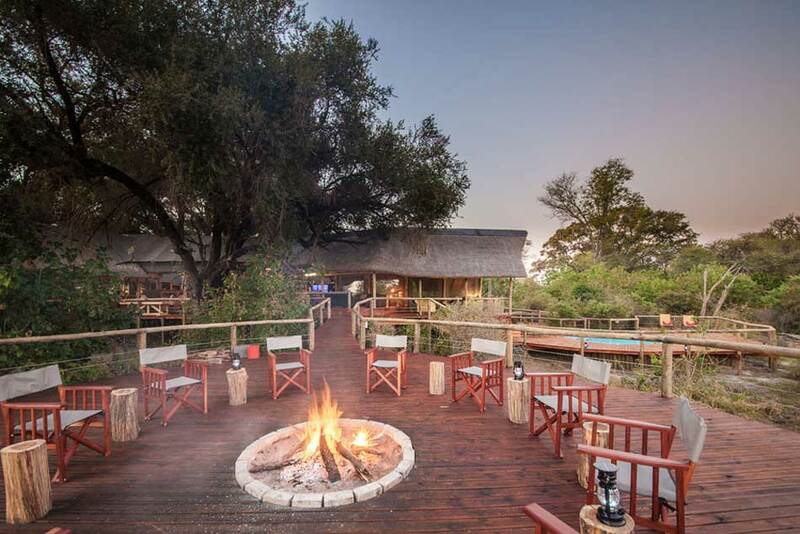 Pel’s Post is the latest addition to the Kruger National Park’s well known Outpost Lodge, located in the revered Makuleke Concession. This region is famous for expansive views from towering rocky outcrops, incredible bird watching opportunities, and walking safaris. It goes without saying that the newly opened Pel’s Post is all about the view. 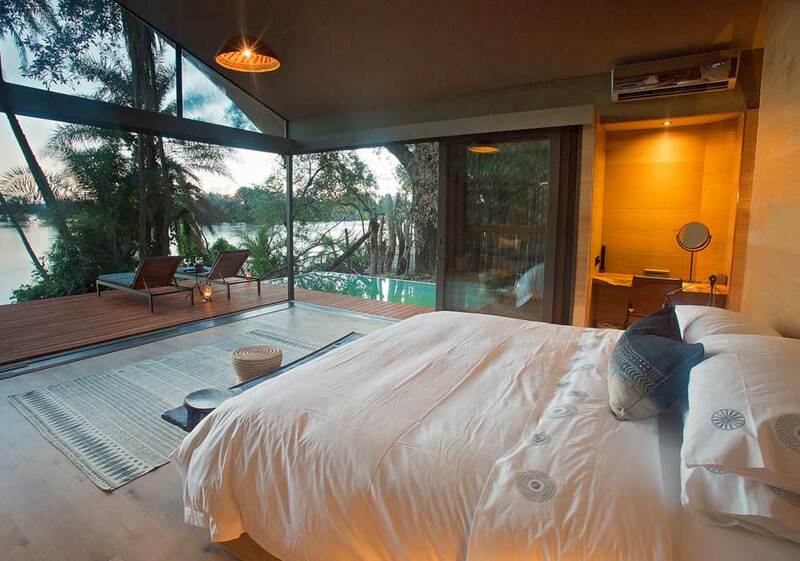 Openness, lightness, stylish minimalism, warmed by African textures; this new private camp is one we can’t wait to visit. It is an exclusive Kruger Park camp catering for up to 8 guests in 4 luxury suites with a private game viewer and professional guide, plus a swimming pool. There is no age limit for children, so families can be accommodated here in comfort and style. It is built with little impact on the environment, using eco-friendly materials and solar power, so stays entirely in tune with the magnificent surroundings. 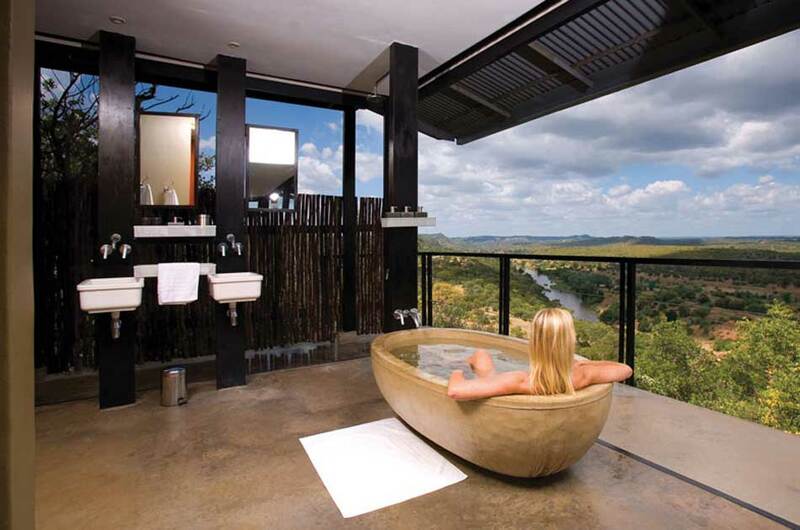 Highlight: Bath tub with a view! The world’s largest island: Madagascar. A place of vastly undiscovered mystery, secret species, pristine bays, aromatic spice channels, alien geological structures, and forests full of unique species. Lemurs are perhaps Madagascar’s most recognisable animals, but there is so much to the island’s wildlife we are yet to find out. This year, we saw the opening of Miavana on the private island of Nosy Ankao off the northeastern coast of the mainland. Nosy Ankao is surrounded by 15 000 hectares of protected marine life offering some of the purest diving opportunities in the world. This is Madagascar’s first luxury eco resort, and it took 4 years of hard work to build. It incorporates the history of the area, protected wildlife, local culture, air, sea, and land activities, and some revitalisingly lavish guest rooms and facilities. 14 Villas are positioned facing the ocean, with stone and palm details, and private beach access. Highlight: Access to the island is in a helicopter!